Vortec air flow amplifiers extract smoke, fumes, and debris to enhance safety, ergonomics, and productivity. These high-flow, bladeless blowers take ordinary compressed air and amplify it up to 60-fold, in un-ducted applications, with no moving parts, so they are inherently safe. 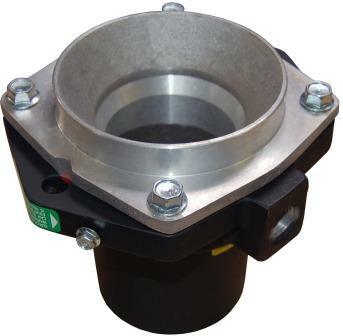 They are easily mounted, ducted, and moved, and with adjustable airflow and output they can be tailored to the project at hand. With no electrical requirements they can be mounted wherever there is compressed air, and their quiet operation meets OSHA noise requirements. The amplifiers are available in multiple sizes, in either aluminum or stainless steel, to deliver flow rates from 32 to 2300 SCFM. In addition to ventilating and exhausting welding fumes, soldering and machine smoke, tank fumes, and other gases, they are ideal for de-dusting of grain, trimming operations such as paper or cloth, removal of metal chips, sawdust, and scrap, or conveying of plastic pellets, small parts, capsule, powders, and more. They can easily adapt from extraction and ventilation of fumes and gases to blow-off applications, such as drying of parts, cooling of moldings, castings, and food products. They can improve the quality through better weigh sorting of under-filled or under-weight capsules, parts, and other light materials. Their “dual function” capability enhances their utility in industrial and commercial environments.